Summer is here and the camping season is in full swing. Whether your vacation plans include the beach, mountains, lake, or a cross country road trip, a quality RV is your ticket to fun and adventure. 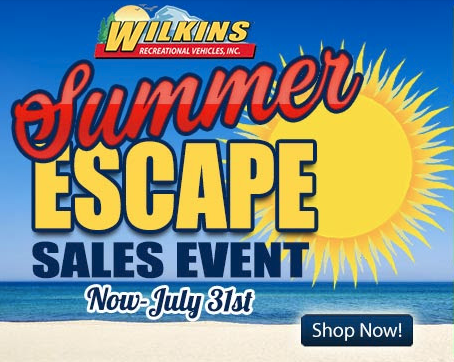 From now until July 31st, the Wilkins RV Summer Escape Sales Event is the place to be for amazing RV deals on both new and used RVs. With four Wilkins RV locations throughout New York State, your dream RV is just a hop skip and a jump away. With these low monthly payments, enjoy camping fun in the sun today! Spend the rest of your summer vacation in cool RV comfort starting at only $105 a month! o.a.c. Don’t miss out on Special Blowout Savings on all Trail Runner RVs on Sale, while supplies last! The Heartland Trail Runner Travel Trailer is available in a wide variety of floorplans and loaded with plenty of options for affordable camping comfort. Not ready to buy new? All pre-owned motorhomes are priced to move! From now until July 15th, we have our entire Used Motorhomes for Sale drastically marked down. Plus, if you purchase a pre-owned motorhome before July 15th, you get a free $1000 gas card! In addition, we have special sale pricing on Pre-Owned Fifth Wheel and Pre-Owned Travel Trailers as well! Check out our selection of Used RVs for Sale priced at just $199 over wholesale! Pick out your favorite used RV and take advantage of these incredible limited time wholesale RV prices. Don’t let summer pass you by. Plan your great escape with a new or used motorhome, fifth wheel or travel trailer camper from Wilkins RV!